While everyone is still coming down from the high of the release of Star Wars: The Force Awakens, we needn't forget that another Star Wars movie is coming out in less than a year. 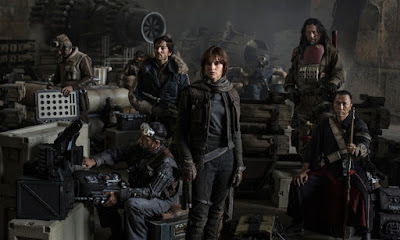 Rogue One: A Star Wars Story hits theatres on December 16th, 2016, directed by Gareth Edwards, and will tell the story about how a band of rebels who stole the plans to the first Death Star. Outside of that, as well as the cast, little is known about the film. Some new, minor details about the film have come to light thanks to online resumes and a report from our friends at Jedi News. First, MakingStarWars.net (by way of Daisy Ridley Fan) came across a character name which may be for the main character of the film. Actress Gabrielle Fritz lists, on her resume on Casting Call Pro, that she played Lyra Erso Picture Double in Rogue One. This had led to speculation that Fitz is the double for Felicty Jones' character in the film, meaning that Lyra Erso is Jones' character name in the film. In addition to that, Jedi News has a report about three more minor characters and the actors playing them in the new film. They are, Bern Collaco as a stormtrooper, Angus Cook as a mechanic, and Nabilah Karim as a "samurai". Obviously, having a "samurai" in the film raises some very interesting questions. It seems likely that this is a codename of some kind, what significance that codename may have is still up in the air. Hope Gareth Edwards does not forget the Bothans or that Bevil Lemelisk designed the Death Star. Boy does this look like a steaming pile of Twilight , Hunger Games, rubbish. Bothans were involved in finding the plans for the second Death Star and that the emperor would be on the space station. Very scant information so far, and only one picture... but I'm far from excited about this. Gareth Edwards makes pretty-looking films, but he gets nothing out of his actors. And who are any of these characters and why should we care about them? As noted above by 'Unknown' this could have been a great opportunity to introduce us to a live-action Kyle Katarn, but it seems Disney want to discard all the other Star Wars material and characters in favour of their own ideas - which could very easily result in mundane movie-by-numbers. ...as great as some of those books were to get us through an era where new Star Wars movies were only done by fans...I am gladly giving them up to enjoy new shows, new movies, and new content. And some of those books were really, really, really bad. Monster was a highly performance driven movie with excellent acting. Also enough with the "but the EU" whining and moaning. The EU was, some exceptions apply, a steaming pile of manure. The EU is gone, dead, and declared non-cannon, so forget it and things will make a lot more sense in your head. They died getting the second death star plans. I need see Bothans!!!! Now!! Kyle Katarn, however, was not one of those steaming piles and was a very well developed character through a game series revolving around him, as well as countless comics and novels. Looks that way doesn't it. Err... You do know the new film is made by a "fan" albeit one who's not really understood the source material. Gotta love the blind glory chasing of so called "fans". You can almost here them chanting "Yes" "Yes" "Yes" as Mickey wees on them from Disney castle above.